The kids were both up early this morning and i could have slept for another month. Darcy had a horrible night and probably kept half the park awake. Must be something in the air cos this morning i could smell wattle all of a sudden and lots of pale pale brown frogs appeared from nowhere. I trod on one that was trying to get into the caravan. Out, little man! Out! And then in the toilets one landed on my head and i had to flick at it to get it off. Tim asked if it freaked me out and yes, it actually really did! LOL! Packed up and on the road well before 10. It's only a short drive to Katherine, a bit over 100km, and we wanted to stop at the Cutta Cutta caves on the way past. 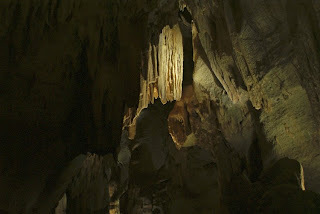 It's an area of limestone caves and rock and they are the NTs only cave system that is open to the public. There are actually two caves in the area (Tindal cave as well) and for the $15 entry fee i will admit i thought we might get to see both caves, or even get to explore further into the Cutta Cutta cave but you do get a good look through and it's quite interesting. 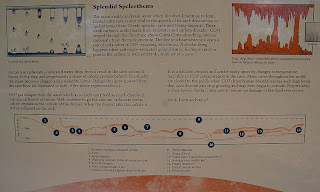 Maybe we have been spoilt by the Jenolan Caves etc from closer to home. ?? But if you are watching the pennies then you are not missing out if you skip this one. Jordy was pretty keen to see a bat in the caves but they were all hiding. He liked the bit where we had to duck and squeeze through the rocks to get through. Actually, Darcy liked that bit too and he lay right back and pointed and chattered away with his "dooh" noises and pointed up at the stalictites on the roof. A short drive into Katherine and we did a bit of a scenic tour through the main street (and out over the bridge towards Darwin when i got a bit lost and then out over the other bridge towards the train station when i got a bit more lost!) Did not do much in the afternoon, I had a massive headache and was feeling a bit sick actually (forgot to drink enough water today) and as soon as the van was set up i had a lay down for a bit and drank a bucket load of water. Tim took Jordy for a swim in the pool and Mum and Dad looked after Darcy. Jordy has had $4 in his Thomas the Tank Engine wallet since we left home and he has been wanting to buy a donut with it for ages! But not a whole lot of Donut Kings around the place. We mentioned a while back that maybe Katherine would have one and he remembered and had been waiting and waiting!! We had to head into town and get some groceries and Jordy was the first one out the door on his way to the donut shop. Unfortunately Donut King has not made it to Katherine yet so we had to settle for a packet of iced donuts from Woolworths. Jordy sat in the trolley and scoffed his (and then had another half of mine). We paid the price that afternoon cos while he seems to be fine on the Donut King ones these ones sent him stupid (like paddlepops and McDonalds thickshakes which are on the banned list!) So we had psycho sugar boy to deal with. Cooked some butter chicken in the microwave and rice in the rice-cooker that was actually really tasty. The kids were both a struggle to get to bed and Tim and i pretty much flaked. Sorry for the lack of photos from today but if you head to your local Woolworths and take a photo of any toddler being forcibly dragged off the car ride out the front then that was our afternoon! !